Fri­day 9 Novem­ber, Gay­don: Aston Mar­tin has announced that it will enter in to an impor­tant new part­ner­ship with the suc­cess­ful Ger­man rac­ing team PROsport Per­for­mance based near the Nürburgring, close to the home of the British brand’s AMR Per­for­mance Cen­tre in Ger­many. The agree­ment, which fea­tures the high­est lev­el of part­ner sup­port from Aston Mar­tin Rac­ing, includes a two-car attack on Germany’s lead­ing GT cham­pi­onship – the ADAC GT Mas­ters – in 2019 with the new Aston Mar­tin Van­tage GT3. 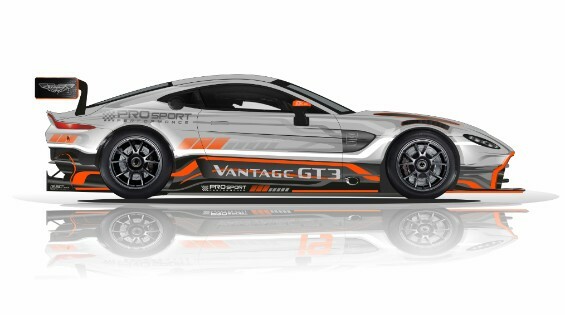 More­over, one of those two Van­tage GT3s will be dri­ven by a pair Aston Mar­tin Rac­ing works dri­vers. In addi­tion to this, PROsport Per­for­mance, the new­ly-crowned Euro­pean 24h GT Series Dri­vers and Teams cham­pi­on, will enter two Aston Mar­tin Van­tage GT4s in the new ADAC GT4 Ger­many series. It will also enter two in the GT4 Euro­pean Series – where the team has col­lect­ed three cham­pi­onship titles (Dri­vers PRO/AM and Team in 2016 and Dri­vers AM in 2013). Some of PROsport’s younger dri­vers will also be eli­gi­ble to be part of the AMR Young Dri­ver Acad­e­my. This lat­est part­ner­ship announce­ment from Aston Mar­tin rep­re­sents a strong advo­ca­tion for the new Aston Mar­tin Van­tage, of which the GT3 vari­ant under­lined its poten­tial on its com­pet­i­tive race debut in the eighth round of the VLN on the Nürburgring Nord­schliefe last month, run­ning trou­ble-free and fin­ish­ing fourth over­all. PROsport is a high­ly-dec­o­rat­ed motor­sport organ­i­sa­tion that spe­cialis­es in GT rac­ing with a record of con­sis­tent suc­cess that charts all the way back to its for­ma­tion by team own­er and for­mer rac­er Christoph Ess­er in 2006. Among its acco­lades, are five class vic­to­ries in the Nürburgring 24 Hours and more than 50 class wins in the cir­cuit-based VLN Cham­pi­onship.